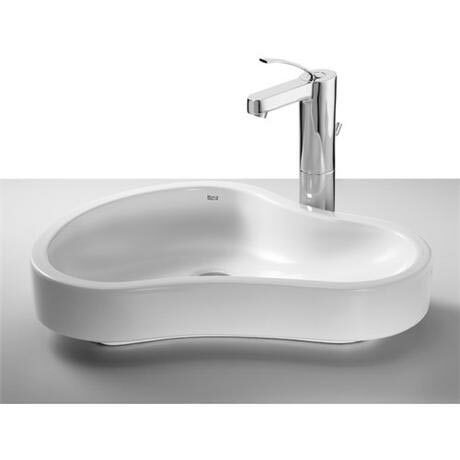 A luxury modern organically-inspired Urbi 8 designer white vitreous china countertop basin from Spanish designer brand Roca. Manufactured by Roca using the best materials and production methods, this means products are more resistant, durable, easy to use and maintain. Comes with a 25 year guarantee against any manufacturing defects. Transform your bathroom with one of our beautiful and contemporary designer countertop basins. Designed to sit on a counter with a freestanding or wall mounted tap. The perfect complement to any contemporary bathroom, the Urbi countertop basin offers a unique shape and style to give any room a feature piece to bring a beautiful aesthetic. Made from highly durable and robust vitreous china, it even comes with a 25 year guarantee. The innovative design gives it a style unlike any other and its build is at the top end of quality engineering standards, giving you the best of both worlds.